“It’s Okay to Miss Someone you Never Met”—a Miscarriage Story. I recently threw away the two positive pregnancy tests that had gazed at me each morning for the past eight months. They sat in the bottom cabinet of my bathroom vanity as I reached for my hairbrush each day. I don’t know why I didn’t throw them out sooner. Maybe it’s because they were a reminder to me that I was able to get pregnant, and can get pregnant again. Maybe I just wasn’t able to let go of the reminder that I once was. Our almost-named baby was the size of a raspberry. We spoke to him (according to my husband) or her (according to me) as my husband laid his hand on my belly every evening while watching TV since the day we learned we were pregnant. We felt blessed and looked forward to our upcoming appointment—the one in which we’d hear our little one’s heartbeat. It is a deep and hollowing experience to lay helplessly sprawled out and bottomless with a technician sitting silently on a rolling stool feeling around and looking for answers amidst the muted room. I knew she couldn’t see our raspberry. I knew I wouldn’t hear the little thumps of blood that gave life to our child. And yet, I couldn’t bring myself to break the uncomfortable silence—until I did. “Is something wrong?” My voice shook, not wanting to face my reality. She left to get the doctor. The next two days were full of polarizing pulls of emotion, caught between not wanting to feel like I was giving up on our baby all while trying to guard myself to prepare for loss. Tests later, it was explained to us that the pregnancy was no longer viable. I was given options for what to do next. On the days leading up to the removal of our confirmed, would’ve been baby boy, I deleted the three pregnancy applications on my phone, unsubscribed from the pregnancy newsletters that I read daily, and deleted the week-to-week countdown on my personal calendar. I didn’t need the sad notifications reminding me of what could’ve been. 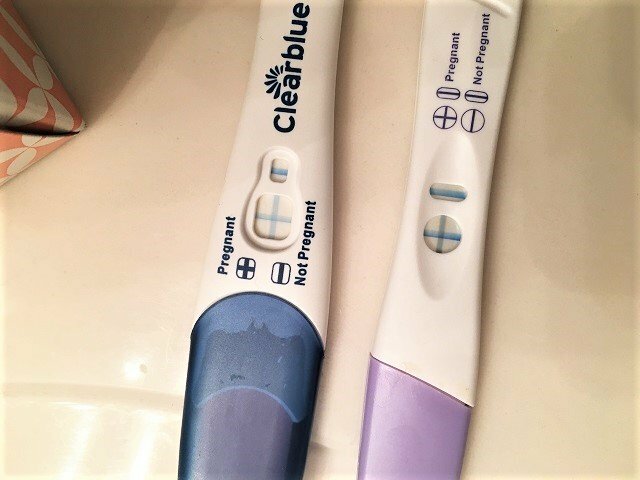 I kept the two positive pregnancy tests that it took to convince me I was expecting and stored them under the sink in our bathroom. Again, I don’t know why. I kept that carefully chosen baby book planner with up-to-date entries of symptoms and potential names written in it. Would I use it again? Should I keep it to remember him? Everything else would be deleted just as if this had never happened—as if this baby had never existed. As I attempted to erase the painful details that accompanied this experience, my symptoms faded. My tiny bloated tummy, my tender right breast, the occasional wave of nausea, and my ability to smell my husband’s beard oil at the end of the day just as strongly as I smelled it that morning all disappeared as I carried our dying baby inside me, anxiously waiting for my D&C procedure that was scheduled for seven days later. I cried every day leading up to that surgery. The seven days felt too long. My husband stayed strong for the both of us, except for the day when he too let it out. I got my period almost six weeks later and I knew my body was healthy again. There was a sigh of relief the first month, as I needed confirmation that my body was doing what it was supposed to do. Every period since then has been a soul-crushing disappointment. It’s been months since my miscarriage and so much has happened since. Every morning, I reach for my hairbrush underneath my bathroom sink, pause, and move on with my day. I smile. I laugh. I work. I stay busy and distracted. But every so often, I think about it. I feel sad and sometimes still cry as our would’ve been due date draws near. I’ve done a lot of reading about pregnancy loss and miscarriages the last few months. Connecting with other women through their stories has helped me in this process. I’m devastated, I’m still mourning, and that’s okay. Learning that I’m not the only one feeling this way has been helpful. It’s okay to feel fear, doubt, and hope at the same time. Or to skip the wine at dinner because you think you just might be pregnant. Or to drink it because you can’t let life slow you down. Or to get angry at your body for tricking you when your period comes late. As heartbreaking as this whole experience has been, allowing myself to process all the emotions has made me stronger. It’s not the monthly disappointments or the momentary periods of grief that get me through. Coming back from those heart-wrenching times is what gives me the power I need. So give yourself a pep-talk. Remind yourself that you’re alright. Be grateful for the love you feel from those in your life. Be present. Meditate. Pray. Read. Connect with others. Be hopeful and stay strong. Rosy Crumpton is passionate about inclusion, culture, and diversity. 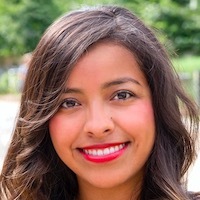 She writes about growing up Latina in the U.S. with 11 siblings, and her happy married life on Big Sister Diaries. She’s hooked on journaling, reading memoirs, community involvement, and off-and-on race training. She likes to share anything that is human, loving, and empowering (especially for women). Follow along on Facebook, Instagram, and Twitter.